In the days prior to adequate floodplain and stormwater management in Mesa County, flash floods could be an issue for valley residents. 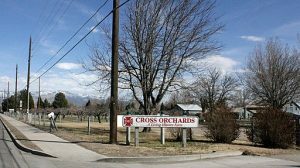 Charles Buttolph, former manager for the Red Cross Land and Fruit Company (and then-owner of his own fruit farm on adjacent land), talks about one such flash flood that swept through Cross Orchards in the 1920’s. Buttolph describes eating dinner with his family at their farm house near 31 and E ½ Roads. Hearing a roar, he went outside to investigate. It was a sunny day without a cloud, yet when he walked up the road, he saw a wall of water at least six feet high rushing through the fields on both sides of an arroyo. The flood ripped up grain that had been planted, churned up trees, took out 31 Road and two bridges, and contained all manner of debris. He got away as fast as he could. The source of the flood? A storm in the Bookcliffs miles away that had traveled downhill in the arroyo and erupted from its banks. 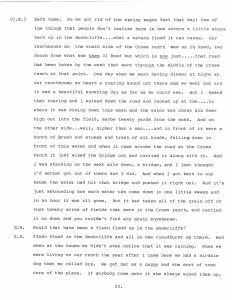 Read Buttolph’s account of the flash flood in the transcript to the left, listen to an excerpt describing the flood, and find out more about the early history of Cross Orchards by listening to the rest of Buttolph’s Mesa County Oral History Project interview in the library’s catalog.